Win a $110 Gift Certificate to Cook Au Vin! Congratulations to Sakina Mahmood on winning our fifty first High Five Giveaway and thank you to all who entered! 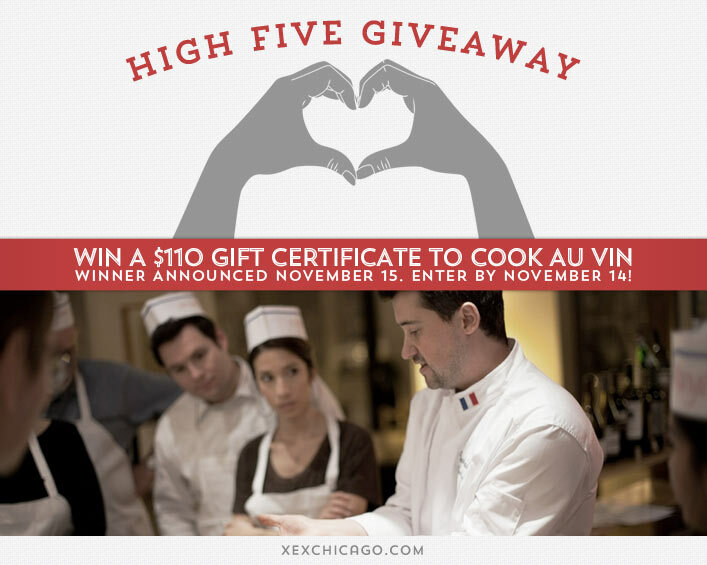 Our next High Five Giveaway is for a $110 gift certificate to Cook Au Vin. Specialized in French cooking class, Bread Baking class and Pastry Making class in Chicago, Cook Au Vin has the perfect class for your event: couple date night, family outing, birthday or bachelorette party, etc. They offer a full experience of French fusion culinary classes, after-work cooking classes, Pastry or Bread classes and Kids classes! Cook Au Vin also provide full service catering solutions in the Chicago area, from intimate sit-down dinners to large banquet parties. They have unique stations for your special event: crêpe cart, giant pan, grilling stations, fondue, etc. Specialty baguettes, croissants, crêpes, loaves, boules, pastries, and more! Known for the quality and freshness of their products, they have been voted several times “Best Baguette of Chicago” by Time Out Magazine! Cook Au Vin is located at 2256 N Elston. Visit their website at www.cook-au-vin.com or call them at (773) 489-3141 for more information. FOR EVERYONE! Use promotional code MACARON at www.cook-au-vin.com and receive $50 off when you book a class. This offer is valid for everyone reading this post, where you win the High Five Giveaway or not! What is it called when ombre hair color goes from light to dark instead of dark to light? Now, just add a comment to this post with the right answer to be eligible to win! The winner will be announced on Friday, November 15. Entries must be received by midnight on Thursday, November 14. Good luck!